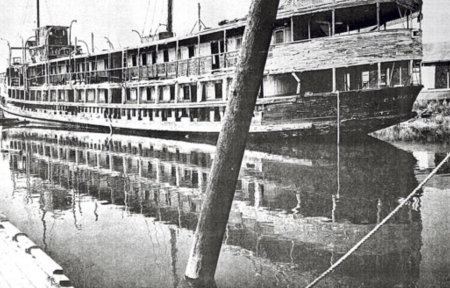 S.S. Cabrillo, stuck in the mud, rotting on the banks of the Napa River. 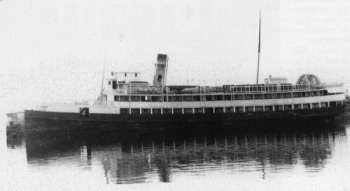 Cabrillo (#201058) (1904-WWII), 182-foot passenger steamer built for the Wilmington Transportation Company which went into service July 1, 1904. 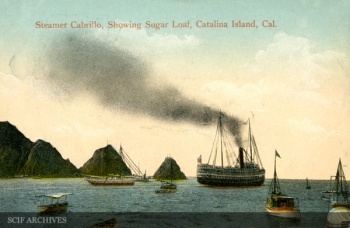 Known as the ‘Queen of the South Coast,’ Cabrillo served Santa Catalina Island from San Pedro for 55 years — her tall stack a common sight in the channel. She was permitted to carry 614 passengers (although this number changed with laws). 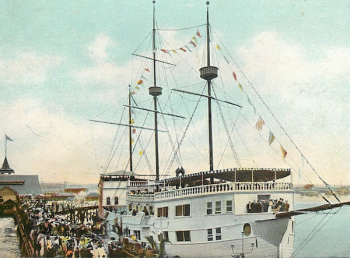 At the time, she was the most luxurious of the vessels making the run to Santa Catalina Island, with ten staterooms, a great social hall, Javanese teak decks, a rosewood staircase, and mahogany bar. The transit time was two hours. 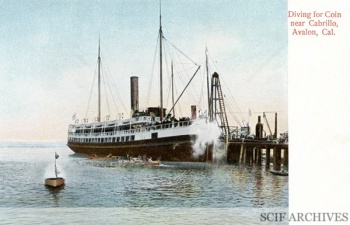 During World Wars I and II, Cabrillo became a troop ship and carried thousands of soldiers to and across San Francisco Bay. After 1918, Cabrillo flew the blue and white flag of the Wrigley’s when they bought rights to the island. 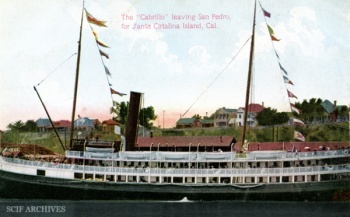 Cabrillo was the last of the wooden excursion ships built for island service. 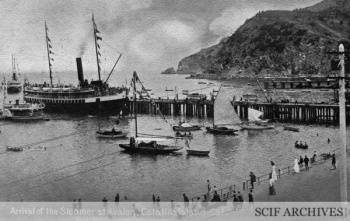 In 1920 the steel-hulled S.S. Avalon supplemented and eventually replaced Cabrillo on her island runs. 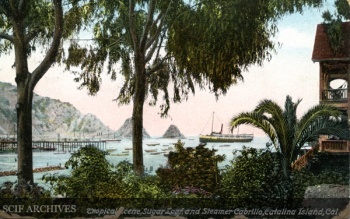 Cabrillo served Santa Catalina Island for forty years. 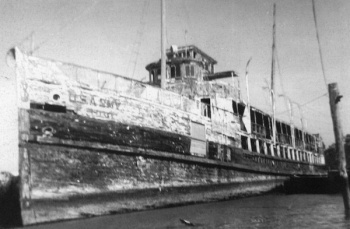 After being used to transport troops during World War II, she was sold in 1950 for use as a restaurant vessel in Northern California. As so often happens, those plans did not materialize and she was ultimately abandoned and left to rot away on the shores of the Napa River. Her name board was given to the Cabrillo Museum. [Huntington. Banning Album 180(601)]. 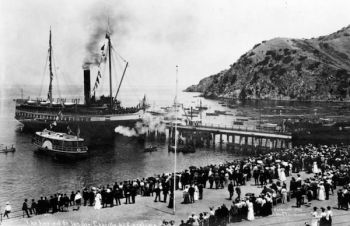 NOTE: The original Log Book for the S.S. Cabrillo, Captain Evan H. Trefathen, for July 4, 1904 through Tuesday, February 14, 1905 is on file at the Santa Cruz Island Foundation. 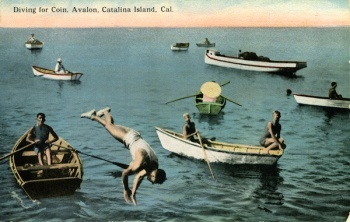 Diving for coins, Avalon, Catalina Island, Cal. AbandonedS.S. Cabrillo on the shores of the Napa River. September 13, 2009 [Napa Valley Register]: “The ghost ship of Carneros. An old wreck is all that is left of a former Catalina beauty. Nearly 30 years ago, while kayaking on the Napa River, Bob Johnstone stumbled on a sight that has haunted his imagination ever since. The weather-beaten carcass of a triple-decked wooden ship, stretching more than half the length of a football field, sat on a mud flat at Moore’s Landing. “What is this thing? It’s huge,” he remembers asking himself. Johnstone returned again and again. “When the tide was in, I could pull up in my kayak and touch it and feel it,” he said. 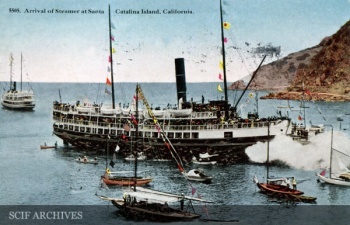 Johnstone had happened upon the ruins of the SS Cabrillo, a steamship once celebrated as “The Queen of the South Coast.” For nearly 40 years she had ferried tourists from San Pedro Harbor to Santa Catalina Island off the Southern California coast. 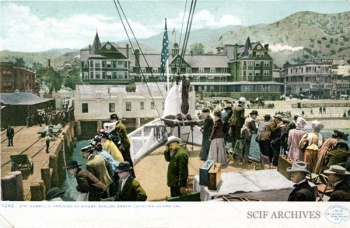 As his research would reveal, “it had been one of the finest ships on the West Coast, but here it sat,” guarded by “No Trespassing” signs, Johnstone said. He was tempted to dock and somehow climb onto the battered superstructure, which resembled a ghost ship from a “Pirates of the Caribbean” movie, but he never dared. “I was afraid of being shot,” he said. As bad as the Cabrillo looked in the early ’80s, things soon got worse. 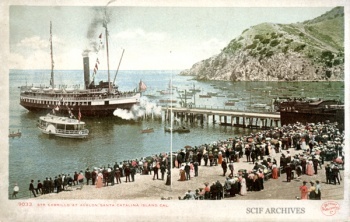 With every visit, there was less and less of the ship, Johnstone said. On a recent September morning, with a reporter in tow, Johnstone showed off what’s left. 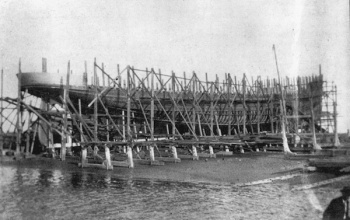 The ragged outline of a wooden hull barely rises above the shore line. 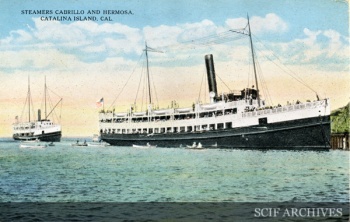 Missing its upper decks, the Cabrillo is now inextricably merged with Napa River muck and tule reeds. Going to pieces. 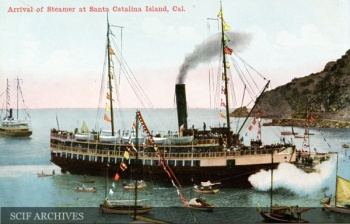 The SS Cabrillo was the biggest and last of the wooden-hulled steamships on the Catalina run. While it would soon be eclipsed by larger steel-hulled vessels, the SS Avalon and the SS Catalina, it stayed in service until World War II. 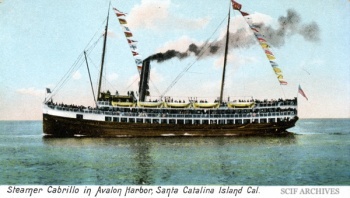 During the war, the Army commandeered the Cabrillo and the Catalina for troop transportation in the Bay Area. 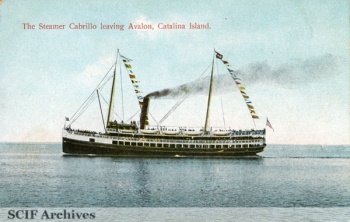 When the war ended, the Catalina returned to excursion service, but the Army held onto the Cabrillo for another few years. What happened next remains murky. Sometime between 1947 and 1950, the Cabrillo, still in good shape, landed next to Moore’s fishing shack on the banks of the Napa River. Frances Proctor remembers playing inside the Cabrillo in 1950 as a 16-year-old. Her stepfather, who worked at Moore’s, was living inside the captain’s quarters. “You walked right up the gang plank and right onto the ship,” she said. 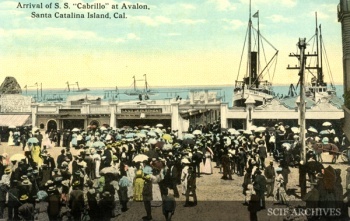 She described the Cabrillo as “absolutely beautiful.” She remembers “a huge lounge. There was an enormously wide staircase with cherry wood and red carpeting.” She and her sister Shirley had great fun. We “pretended we were going on a cruise, that one of the staterooms was ours,” she said. The good times didn’t last. “Chuck’s idea was to turn it into a restaurant-casino,” Proctor said. “When he couldn’t get the permits, he started salvaging it. He started selling the woodwork, the carpeting. He salvaged it out to whoever.” “It would have made a beautiful nightclub or dinner house, either one,” Proctor said. In retrospect, Proctor said she shouldn’t have been surprised that Moore’s idea for a floating restaurant didn’t work out. “My mother said he was a dreamer. He had stars in his eyes all the time,” she said. The Real Glory. From her family’s archive, Proctor produced a snapshot of the Cabrillo docked at Moore’s in 1950. Looking nearly as impressive as the Queen Elizabeth II, now a tourist attraction in Long Beach, the ship carried the U.S. Army logo on the bow. Albert Giovannoni, who has owned commercial operations on the river since the ’50s, said it’s hard to remember events from so long ago. “A lot of people have dreams. They let them go, go, go. 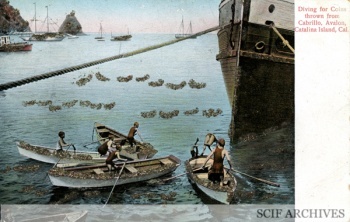 Then it sank,” he said most succinctly. “If it cost any money, he wouldn’t have spent it,” Giovannoni said of Moore, who died nearly three decades ago. Jim Matheson, Janice Owens’ father, was living in Carneros some 60 years ago when Moore docked the Cabrillo. “All I know is, it showed up there and old Chuck Moore started tearing it apart,” he recalled. For a more definitive explanation of the Cabrillo’s demise, a call went out to Chuck Moore’s son, Ken, now an attorney in the South Bay. Born in 1952, Moore said he grew up believing that he father had plans for “some sort of bar and restaurant.” When his dad couldn’t get a liquor license, “it forced him to begin salvage operations,” he said. “I think he was frustrated about his inability to obtain a liquor license at that time. He was caught up in the bureaucracy of his day,” he said. Moore’s earliest memories of the Cabrillo are from the late ’50s. “In my first recollection, it had already been partially salvaged,” he said. “I can remember going up there with my dad a couple of times,” he said. “Within a few years the deck deteriorated and it became unsafe.” The Cabrillo has been resting on mud for decades. “I don’t know if he intentionally scuttled it or not,” Moore said of his father. The Moore family still owns the Moore’s Landing restaurant building, several dozen adjacent cottages and the land next to the ruins of the Cabrillo. As far as Moore is concerned, the Cabrillo’s rotting remains should be left as they are. “I’m sure it enhances the fish habitat,” he said. For a glimpse of the SS Cabrillo in its heyday, a person can visit the Los Angeles Maritime Museum in San Pedro. “We have a model of Cabrillo on display here,” Trivelli said. “It’s very nice.” According to the museum, the Cabrillo, outfitted with a dummy second smokestack, starred in a 1939 Hollywood film, “The Real Glory,” a romantic adventure starring Gary Cooper and David Niven. 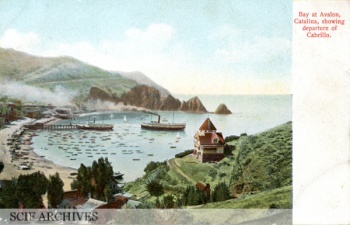 The Catalina Island Museum on Catalina is the repository of the Cabrillo’s name plate. The name plate is not on display, but a half-hull model is. If the film and the museums are out of reach, there’s always lunch or weekend brunch on the deck at Moore’s Landing. The remaining shards of the Cabrillo are within view. Johnstone retains creepy memories of dining in the ’80s at the old Moore’s, a greasy spoon heated by a wood-burning stove. The stove gave off a lot of heat, he said. They were burning the Cabrillo. This page was last edited on 18 March 2018, at 07:08.